Details: Window trim and crowns, sidelights around main entry, pedimented gable dormers. 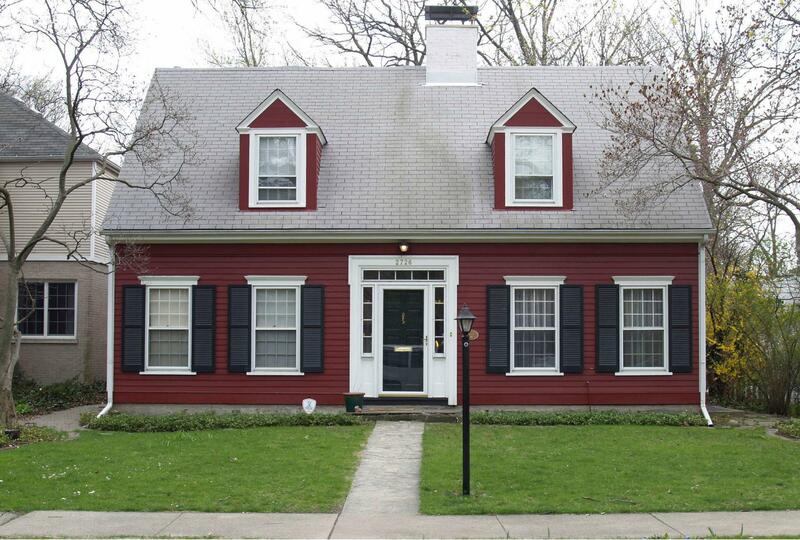 Historic Features: Center entry door with transoms above and on sides, twin gables, shed dormer in rear, shutters, pediments above windows, center chimney. Building Permit Description: 2 sty frame single family residence, 36ft w 24ft l 30ft h, w/ attached garage. Exterior Alteration Permits: BP#25686, 1947.11.20, new porch and convert gar to bedrm, $1500, Wayne Fox-OWN, F.W. Cauley-ARCH; BP#25687, 1947.11.20, detached frame 2 car gar, $1000, Wayne Fox-OWN, F.W. Cauley-ARCH; BP#91-22733, 1991.03.19, 2 sty add, $85,000; 08ROOF-0412: Tearoff and re-roof; 06FRA0000000162: Fence replacement in kind.